Does your yard need more shade or privacy? Tree planting can increase the beauty and value of your home. Trees can offer a retreat from neighbors and noisy streets while attracting beneficial wildlife. But how do you choose the best types for your yard? Finding the perfect location for your trees will help them thrive and give shade to your yard. Many trees grow better in full sun and require space to draw nutrients from the soil. Some types of trees are excellent as wind or sound barriers when placed along a property line. Trees may cause damage to property if set too close to buildings or near underground pipes. A trained and licensed professional can find the ideal tree for your area and specific need. Size is an important consideration when considering a tree planting design plan. How much will one tree grow? How close should you plant it to other trees? Will it give enough privacy? An expert can design a landscape plan with current and future growth in mind. Native trees usually perform better in local climates and soil. Native trees also attract native animals and insects. Other trees may do well, but you will want to consider trees that have a proven record of success in your location. Some species of trees should be avoided because they can become invasive. Others may not be able to survive severe weather, pests, or diseases. Many experts generally recommend against certain types of trees, such as Bradford pears, which have a short life span and are prone to disease. A few species like sweet gums release seed pods that can be a safety hazard to children and pets. 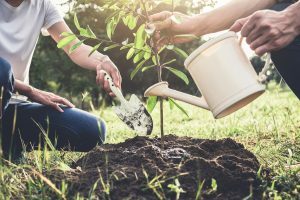 A licensed contractor can help you find the best trees and recommend the best tree planting time for your area. Once your trees are planted, you can enjoy them for many years to come.